With 6 mouths to feed (5 that can eat real food, sorry Zeke – soon!) – a weekly trip to the grocery store is a must. We cook almost all of our meals at home. The kids take their lunch to school (read: 5 ways to get your kids to eat their lunch). And with my Pinterest addiction, there always seems to be a dessert to try out. Each Saturday, 2 hours are devoted to getting the grocery chore done. Last week after being introduced to the Grocery Guru app by friends at Lunchbox – I gave the app a whirl on my Saturday grocery shopping adventure and was pleasantly pleased! Before shopping, I went through the refrigerator and pantry, determined what we needed and made a shopping list in the app. I also needed to make a trip to Sams Club, which requires a different set of needs. I was able to create an additional, separate list for the 2 stores I needed items from. Amazingly, I didn’t forget a thing. Plus, carrying around a phone is so much easier than the old school pen and paper shopping list method. Next week, I am going to try out the online option for typing in your list and syncing with your phone, rather than just using the app. Grocery Guru is your ultimate shopping tool. Create and manage lists at home and in-store with seamless syncing between your desktop and mobile phone. Share lists with friends and family when you need a little help getting them completed. And consult articles from our Gurus when you need some mealtime inspiration. This is the way to get your grocery shopping done. 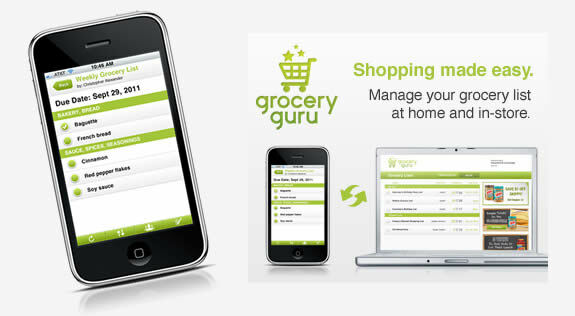 Grocery Guru app is available on iPhone, Android and Blackberry! Do You Use an App to Help You With Your Shopping? Disclaimer: This is a sponsored post and I was compensated by the advertiser to write this post. I was provided with the subject matter to write about but our thoughts, opinions and words are 100% mine. All information contained on this blog is copyright 2011, All Rights Reserved. Awesome App for parents! You really know your stuff! articles with other like-minded tech parent bloggers? If yes, please email me at [email protected] with Parents in the subject line.